Even though I am 45, I attended my first gaming convention this weekend. CelestiCon V was held at the Fremont Marriott in Fremont, CA. Better late than never, I guess, though I'm getting too old for marathon gaming sessions. That said, I played some favorites and was introduced to some new games this weekend. Here's the list. Since I was meeting someone early to drop off a game I sold, I wound up getting there very early. As a result, I think I was the second person to receive their badge, so I got the free gift! This looks like the kind game you could play at lunchtime. After listening in to the first couple play Fictionaire for a while I hung out in the open gaming area I eventually got two other guys to play Patrician. This is approaching filler status for me, as it's easy to explain and very fast to play with any number of people. I came in second, which seems to be a pattern with me. The first big event was a massive PitchCar layout. Eight of us took turns flicking our way through the 50+ feet of track. I took an early lead and although I got passed twice, I still came out ahead at the finish line! This is an awesome game! If we hosted more parties I'd be looking for a set or two of this. 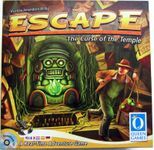 Next up, the owner of PitchCar had brought Escape, so I played this for the first time. A lot of fun, though we finished and escaped with about 2-3 minutes remaining. I just got this last week at a ding & dent sale, and I'm hoping I'll get some play from it. I certainly enjoyed it. 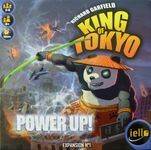 From Escape we moved on to King Of Tokyo with the Power Up expansion. Thanks to some smart card buying I brought 'em all down with the spill-over damage power! This was my second play, and it's much more fun with the expansion cards but probably not something I'll buy. After a lunch break, and an inability to find someone that wanted to try Speicherstadt or Vanuatu I joined a scheduled game of Trajan, which is one of my current favorites. I was doing pretty well but we all let the leader do too much building and he ran away with it. 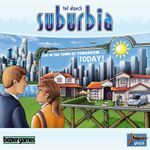 On Friday evening we had two games of Suburbia scheduled. This game was new for me, though I had heard about it before. This is a GREAT game!!! The only thing that stopped me from buying it is that one of the folks in my gaming group said "Oh, I have that, but haven't opened it yet -- you should take it and try it out." A big thanks to Sonja, our GM, for doing a great job explaining the rules. Saturday morning I started with a Finca session. Finca is probably in my top two or three games, so I was happy to join in. I don't think I've played such an intense game of this before! Lots of gnashing of teeth as the tiles each player was planning to take disappeared. As tends to be the case, the guy who never played before and wasn't completely sure what he was doing ran away with it, winning 60-41-40 (me)-23. After Finca, I had a gap as I found two couples who were interested in playing Village in the afternoon. So, I fit in a game of Biblios. I've only played once before, as had my opponent, and it lead to a close game. 7-7, with me losing the tiebreaker by one card of gold. I had forgotten how good a game this is. Last game for the day was Village plus the Village Inn expansion. I really need to get repeat plays of this game, because I swear it takes 15-20 minutes just to explain all of the possible actions and the mechanic of time passing to new players. As Rahdo said in his excellent walkthrough, Village Inn makes this good game so much better, and I'm very happy I bought it. After meeting up with some new friends I played my first 2-player game of Race For The Galaxy, and loved it! I won 34-29, which I attribute to playing San Juan enough that the basics of the game came to me pretty easily. RFTG was a filler, as I waited for some folks to finish up a game of Bruges before breaking out The Speicherstadt plus Kaispeicher. This was the first time I had played the extension, and I'm a bit torn about it because some of the new cards are almost too powerful. One player got the Glazier and was able to convert ships into coins at such a fast rate that the other two of us really couldn't get back into the game. He won with 50+ points, which I have never seen in this game. After dinner I finished up with Glen More, with the same folks that played Speicherstadt. We had some rule confusion when it came to the meaning of tile activation, and I didn't catch on to the concept of tams vs. chieftains. As a result, I probably cheated myself out of some points and gave too many to the eventual winner, but I came in second by 4 points. We described it as 'interesting'; I would definitely play it again but it has a very odd, almost abstract vibe to it. Now I'm done. A relaxing Labor Day off and then our regular group reconvenes Tuesday night.